The Days of Johann, an agility dog! : Chet the Dog is back in 'The Sound and the Furry'! Chet the Dog is back in 'The Sound and the Furry'! The super great folks at Atria Books provided us with an advanced copy for free to review, and we finished it last week! As with all the books in the Chet and Bernie Mystery series this one doesn't disappoint. Set in New Orleans, rather than their home base in the desert, Bernie is asked by an old criminal pal to help find his brother Ralph, the only one of the Boutette family that's on the straight and narrow. Sleuthing through the new found smells, sights, sounds and tastes of Lousiana, the bayous, rain, Bourbon Street and the Mississippi, Chet and Bernie encounter the legendary Izo (the biggest, baddest Gater in the south), the ancient rivals of the Boutettes (the Robideaus), stolen shrimp, biker gangs and big oil! 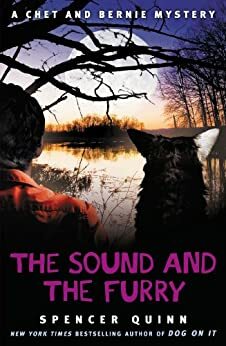 With Bernie's fearless super sleuthing skills, and Chet's canine cunning and 'nose that knows', 'The Sound and the Furry' is packed with twists and turns that will have you digging page after page. 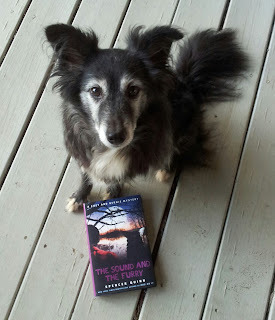 'The Sound and the Furry' was released on today and you can order it on Amazon. And if you'd like to dive into the other books in the Chet and Bernie Mystery Series, check these out! Just click on the images and you can go right to Amazon. Super fun, light, enjoyable reading, at it's best.